The Aprilia RST 1000 Futura shares a sidestand cutout switch with all the other 1000cc Aprilias and over time this can give trouble due to corrosion. It’s placed right where it collects lots of crap from the road, but it could be fair to say that the switch itself is either poor quality or poor design. The switch operates the amber warning light on the dash, and also cuts the engine if the bike is put in gear when the sidestand is down. Sidestand light comes on when the stand is up, and/or poor running and/or engine cutting out intermittently with no warning, no EFI light and no code. The experience of others has shown that if you replace the switch it’ll only fail again. It’s also expensive to replace at about £40. 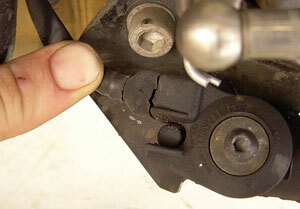 Aprilia Racing supplies a jumper, which plugs into the connector to the switch and disables it. It’s intended for use on RSVRs used on the track, but the part is the same for the Futura. If you want to buy the Aprilia jumper, you can get it from AF1 in the USA, or any UK Aprilia dealer. 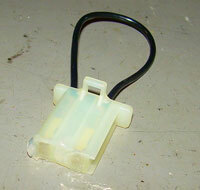 As an emergency repair, you can also short out the two wires using a scotchlock (or whatever you fancy). Ken’s Falco site also has instructions for repairing the switch itself. Note: The sidestand cutout is a safety feature, and doing this mod removes that safety feature. If you choose to disable it, you will be able to ride away with the sidestand down, the consequences of which are likely to be disastrous. I know this is obvious, but like anything else on this site, you do it at your own risk. Incidentally, the sidestand switch is listed as a service item, to be checked, cleaned and replaced as necessary every year or 4,650 miles.